The yoga retailer is following a strategy that works for powerhouse athletic brands. lululemon athletica (NASDAQ:LULU) stock has been on fire over the last year, soaring 147%. Thanks to years of work to improve operations, the company has returned to its old form of high growth not seen since prior to the 2013 quality control debacle. But one of the overlooked factors that is helping to light the fire under the brand are collaborations the company has made with notable designers and celebrities in the fitness world to create limited edition clothing pieces. These collections create a lot of buzz and sell out quickly when they release. It's just one more tool management has in its arsenal to lift the brand's value, and it shows Lululemon following in the footsteps of its larger peers to grow the company. Francesca Hayward. IMAGE SOURCE: LULULEMON ATHLETICA. In 2017, Lululemon made some splashes when it partnered with shoe brand Athletic Propulsion Labs (APL) to create sneakers featuring colors exclusive to the yoga retailer. Earlier that year, it had collaborated with celebrity trainer Taryn Toomey to create special edition yoga pants and tops for women. This year, Lululemon seems to have kicked this strategy into another gear. The company started the year by launching a limited edition collection for men in collaboration with Canadian apparel brand Roden Gray. The items were a hit with men, fusing a streetwear aesthetic with Lululemon's technical design prowess. But the latest collaboration may be the highest-profile one to date. Recently, Lululemon teamed up with Francesca Hayward, the principal dancer of the Royal Ballet of London, to design pieces that are inspired by costumes from the Royal Ballet archives, as well as styles and colors that drew directly from Hayward's input. The collection just launched in October and several pieces are already beginning to sell out. This strategy of releasing limited quantities of certain styles is consistent with the inventory management style started under former CEO Christine Day, which proved very successful in driving brand value and very high inventory turnover that was the envy of the retail industry. Day resigned in 2013 in the middle of the infamous luon pants recall, but Day's tight supply approach to merchandising has continued to stick with the company's operating culture. By releasing these special edition collections, Lululemon is essentially turning its premium styles into one-of-a-kind collector's items that cultivate a must-buy-now mentality among its loyal customers. Management has been dropping these collections with a cadence of about once per quarter. 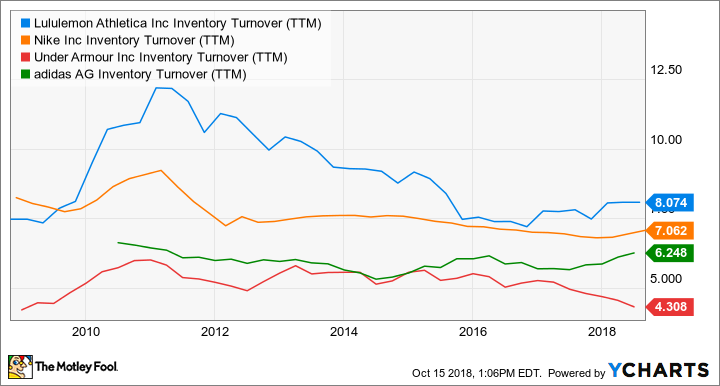 To understand what this could do for the company's performance, take a look at this chart, which shows Lululemon's inventory turnover compared to peers. LULU Inventory Turnover (TTM) data by YCharts. Note the spike in Lululemon's inventory turnover ratio during Day's tenure when she instilled a tight supply inventory management style across the company's operations. Since 2011, Lululemon's inventory turnover ratio has drifted downward along with Nike (NYSE: NKE), Under Armour (NYSE: UA) (NYSE: UAA), and Adidas (NASDAQOTH: ADDYY), but the yoga retailer has still maintained higher turnover ratios than its peers, reflecting Lululemon's more effective control over supply and demand. We can see in the above chart that Lululemon's inventory turnover has started to improve over the last year, which correlates with the timing of its recent collaborations. The recent ones with Roden Gray, Taryn Toomey, and Francesca Hayward come at a time when Lululemon is one of the hottest apparel brands around. In the last quarter, sales grew 25% year over year, an acceleration over the prior year's second-quarter growth rate of 13%. Margins expanded, which drove 97% growth in earnings per share. Overall, Lululemon's merchandise strategy is obviously striking just the right note with customers, which is lifting demand. By collaborating with notable designers and celebrities, Lululemon is using the same playbook that top athletic apparel brands have used for decades to grow their brands. Nike and Adidas have grown their respective businesses by signing basketball stars to shoe contracts. Although Lululemon sells a more niche product than basketball sneakers, the yoga brand's strategy to release limited edition collections could have a similar impact on its growth. And Lululemon is definitely onto something by signing a ballerina. Under Armour recently launched a collection in collaboration with ballet star Misty Copeland and there has been a surge in popularity of barre classes -- a workout that simulates the movements of ballet without requiring you to actually do ballet. Every time one of these new collections drop, Lululemon's brand gets more exposure as bloggers and fashionistas rush to write up reviews. Strong sales of these special collections not only assist to drive up inventory turnover but also margins, since quick sellouts of these premium items eliminate the need for markdowns. The recent collaboration with Francesca Hayward of the Royal Ballet should stoke the fire of Lululemon's momentum in the short term, and further collaborations with notable names in fitness will go a long way toward building brand value over time.